This freaky flick may be set in 16th century New England, but it's as terrifying as any modern horror you'll encounter. Horror master Stephen King had two things to to say about one of the most buzzed about movies at Sundance. “The Witch scared the hell out of me,” he tweeted. “And it’s a real movie, tense and thought-provoking as well as visceral.” It’s enough to scare Stephen King and it’s a real movie? We’re sold. The Witch begins with our heroine, Thomasin, forced out of her community—banished, in fact, because of her father’s inability to play by the rules. This would be terrifying enough in 2016, but this is the American wilds of the 1630s. Thomasin and her family are truly on their own in an unknown land, determined to define life for themselves. We know from the start that Thomasin is not as devout as her godly parents. She freely admits she has committed every mortal sin “in her mind.” Perhaps trying to make it up to mom, or to the Lord, she goes to play a game of peek-a-boo with her infant brother Samuel. But after one “boo!” too many baby brother has vanished into thin air, whisked into the forest by some sinister force. Let’s get this out right now: If you are the type of moviegoer that cannot tolerate violence, even implied, towards children, this horror movie is not for you. It becomes painfully obvious that Thomasin’s family has been cursed—but for what reason we don’t know. Thomasin’s mother is convinced that God has abandoned them, and she may be right. The disappearance of baby Samuel is met with the abduction of his elder brother Caleb, and things just get worse from there. Without giving too much away, fans of demon possession films like The Exorcist or The Conjuring will delight in the gross-out moments that follow, accompanied by the eerie little ditties sung by Thomasin’s creepy pint-sized brother and sister, Mercy and Jonas. Yet the success of The Witch comes from its excellent cast and attention to artistic detail. Ralph Ineson’s booming voice is the first sound we hear, setting an ominous mood for the rest of the film. Game of Thrones fans will delight or shudder at the sight of Kate Dickie, who played maniacal mamma queen Lysa Arryn in the fantasy series. Here she plays Thomasin’s intensely god-fearing mother. Newcomer Anya Taylor-Joy plays Thomasin, carrying the film with the gravitas of a much older actor. 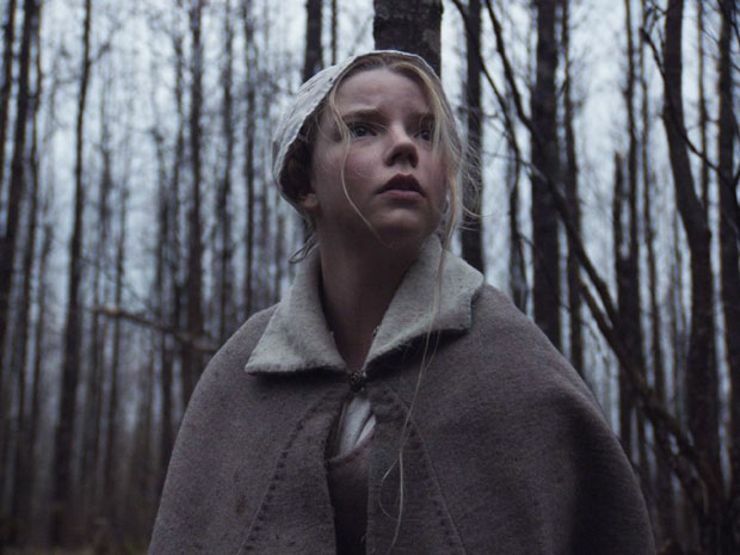 Director Robert Eggers, who is also the film’s writer, commits fully to period in which The Witch is set, even using dialogue pulled from historical documents: accusations of witchcraft and subsequent trials. Eerie signifiers that an agent of the Devil haunt the film—crops fail, the chicken lays dead eggs, the goat milks blood—while beautiful camerawork worthy of a painting by Vermeer elevate The Witch to one of those great horror films that also have a brain. What’s truly at stake here is the family unit—the paranoia that isolation brings, and the blame for hardship. The only disappointing element to The Witch is the physical depiction of the sorceress herself. Historically, a witch represents a woman who doesn’t fit in, or who chooses to live outside of society’s boundaries. Horror movies often depict such figures as either a seductress in a red cape or the polar opposite, a white-eyed crone draped in black shawl, living alone in a creepy cottage in the woods. Alas, The Witch falls back on those traditional portrayals, even using an old woman’s body as a gross-out technique—which just feels lazy. Because there’s nothing so terrifying as a woman who does exactly what she wants, on her own terms, on her own turf. In these times, an accusation of witchcraft was akin to a death sentence. Would you take your chances at the tribunal? Or follow that black horned goat into the woods?